Stormfall is a free to play strategy MMO that can be played directly in your Internet browser after a quick registration through the official website players will be faced with their own fledgling Castle that they must build up and expand in order to combat the various threats that await them in the world from sophisticated enemy AI to aggressive and competitive real-world players looking to claim your lands and resources for themselves. Using strategy, tactics and diplomacy players will constantly be fighting for their own survival and of the people they have sworn to protect. Players do not have to go at it alone, where there are rivals and aggressors at every turn so to come players create diplomatic relations with other Lords to open up trade, defensive agreements as well as forming more long-lasting official alliances using the League system. However, whilst the league may offer you more protection and the sworn allegiance of other players and their armies so too does it attracts other rival leagues that will no doubt a challenge your supremacy declare war. This competitive and PVP focused aspects of the game graphics achievements and bonuses to successful leagues that are able to stand out and prove themselves as the best. To stand the chance in this world each player will have to focus on building up their own territory and Empire, starting with their Castle. 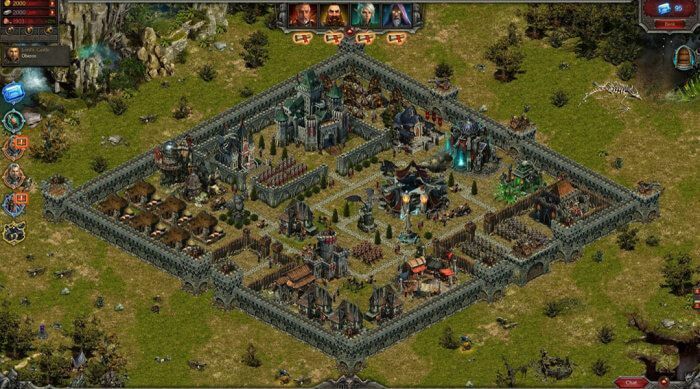 Each building that a player can build within their Castle Walls serves a specific purpose, everything from resource gathering to creating new military units. This to build these and maintain their armies players will have to manage their resources carefully, balancing their use of iron, gold and food required to not only construct and train units but also maintain them indefinitely. Armies in particular require food hourly to remain in your ranks, with a food shortage you may quickly find your troops going AWOL, so a large army must be balanced with a large food supply. However, creating resources through your own efforts and the buildings you have constructed is only one source, players are able to trade resources with each other, particularly between their allied League Lords. Alternatively players can take what they need through conquest, attacking neighbouring castles and pillaging their wares and resources for their own! Players also have the option of conquering various settlements and villages, these independent locations are scattered across the forests and planes that lie between you and your enemies. Attacking these settlements with defensive units will turn them to your side and then you must back them up with defensive units and hold it for at least an hour for resources are gathered from the location. Players are also able to siege castles in a specific siege feature; when a besieged castle is occupied players can earn percentage of their iron and gold production, the higher the level of the Castle that is being besieged the higher the percentage of resources that are earned. Units and buildings are unlocked over time through the Lost Arts system, a technology tree type feature that allows players to learn new technologies and techniques that will advance their Empire. To learn these lost arts, once said to be the secrets of the mystics and mages of old, Lords will put to tasks their scribes and scholars who after a day of gameplay will unlock the mysteries of one of these scrolls that can then be used to learn a new technology; everything from new buildings, new units to taming wild’s mythological beasts and using them in your army. These scrolls can be traded between players sold on the market.